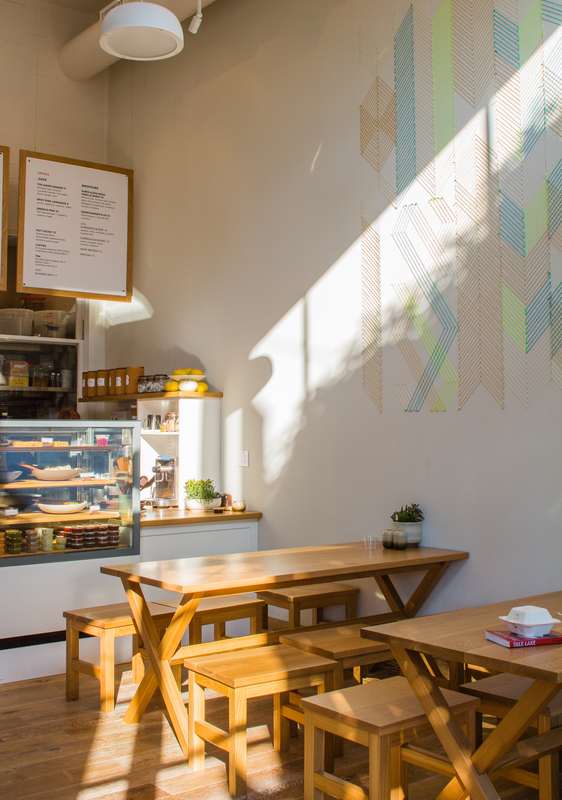 We also installed a string art wall inside, which we wrote about here. 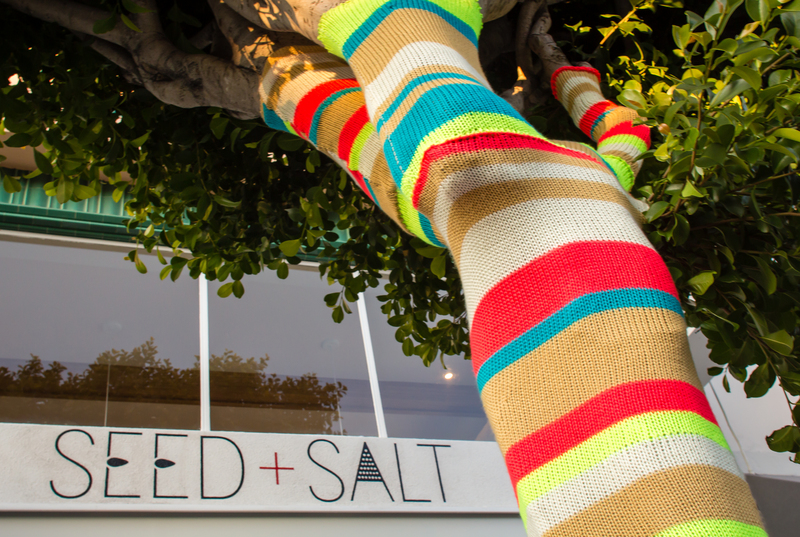 We knit the tree yarnbomb with Caron Simply Soft yarn on our Brother KH-270 machine. It took about a day of active time to design and knit eight pieces from measurements, a day of inactive time to Scotch Guard and dry them, and four hours of seaming to install. You can find more details about the yarn and gauge on the Ravelry project page here. People love to talk to us when we install! We had the usual questions: How long did it take? What’s this about? How do you knit it on there? Was the tree cold? Can I touch it? Does it hurt the tree? We explained that it was a fresh, playful, and cozy way to decorate the restaurant’s facade and should last well over a year with plenty of hugging and petting from passersby. And our work has received the seal of approval by an arborist. Since we left plenty of room at the bottom for dogs and Scotch Guarded against dirt, we think its biggest threat will be sunbleaching, but the neons and neutrals should weather well. This time we also had some new comments, including that this design looks a bit like tape from across the street! (We usually hear that people think they’re painted on.) And as usual the grown-ups enjoyed it more than the kids. We find that kids, who are putting together the way the grown-ups say the world works, expect their own world to be silly but grown-ups to be serious. 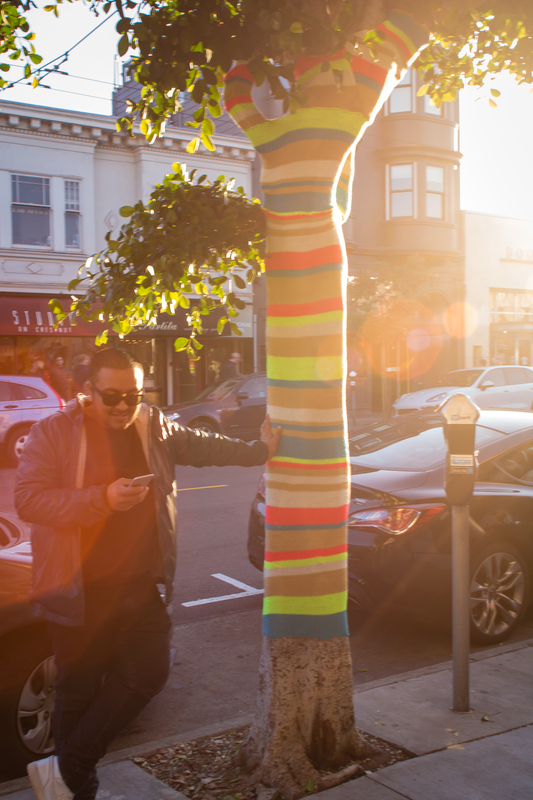 And so kids wanted to know why we were doing such a silly thing more than the adult passersby, who generally stopped in their tracks to rejoice that someone was literally sewing a colorful sweater onto a tree for fun. Rain’s biggest threat to yarnbombs is that it rinses the dirt from the tree into the knitting, which then dries again with dark smudges. Our recent deluges rinsed this cute tree clean and now it’s ready to endure any weather with playful good cheer, just like you’ll do after eating a clean, fresh meal from Seed + Salt. 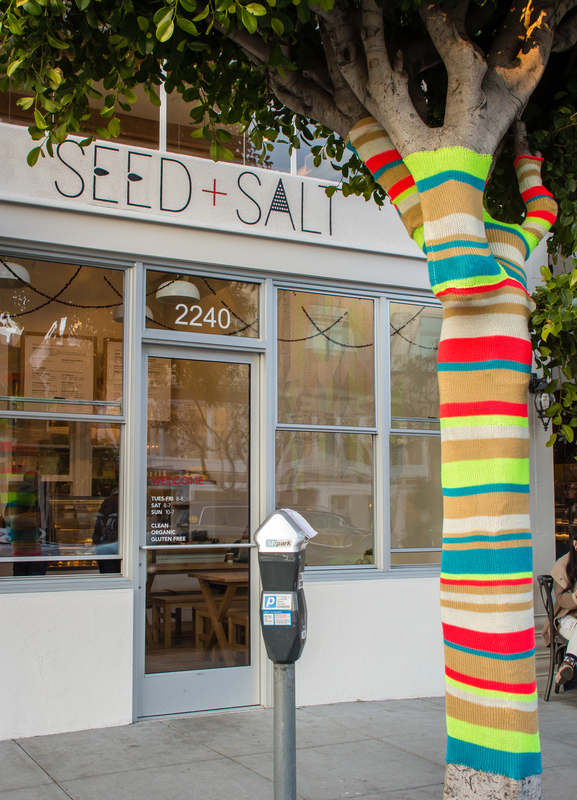 Visit and tag us @knitsforlife and @thedappertoad in your #yarnbomb pics! It’s wonderful – love it!